﻿Brandon Mitchell and Singers With A Purpose (S.W.A.P.) are an anointed group of musicians,bringing a fresh new sound to Gospel Music. The Jackson, Mississippi based group infuses traditional and contemporary gospel music, and has become one of the most sought after music ministries in the state of Mississippi.Brandon Mitchell founded Singers With A Purpose in April of 2006 with a group of college friends on the campus of Alcorn State University. Since their conception, they have ministered throughout the country spreading the good news of Jesus Christ. They have shared the stage and worked with such artists as Shirley Caesar, Vashawn Mitchell, Malcolm Williams, Jonathan Nelson, Lee Williams, Mama Mosie Burks, J.J. Hairston, and Stan Jones just to name a few. S.W.A.P. furthered their music ministry in 2008 with a self financed live recording entitled “I Feel A Move”, that was released in July of 2010. This album featured such artists as Lillian Lloyd, of Ricky Dillard and New G, C. Ashley Brown, of Hezekiah Walker and LFT, Carischa Foster and Larry Johnson, of the Mississippi Mass Choir. During the 2010 Gospel Music Workshop of America, Brandon Mitchell and S.W.A.P. took Cincinnati by storm ministering at several events ushering in the presence of God. Their performance at the Verizon New Artist Showcase that week gained them national recognition and an article on BET.COM. by Torrence Glenn. 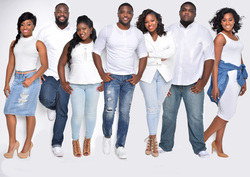 The groups’ favor, anointing, and fresh sound has opened many doors on the national gospel scene. They have been featured on albums with Jackson Southernaires singing Andre Crouch hit “Take Me Back” and Brian Courtney Wilson’s single “Awesome God”.